Click on the image above to view some tips on how to create an essay that will impress your future school. Click here to read the text behind the image. Juggling full-time work and the prospect of an advanced degree program can be overwhelming. 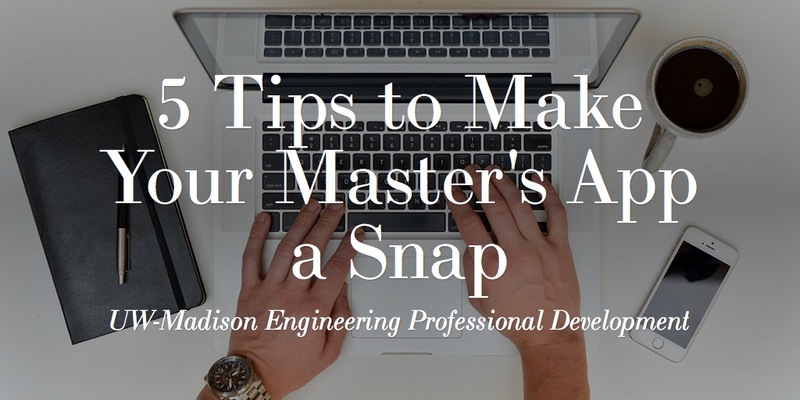 With the early deadline for many of UW-Madison’s online master’s degree programs coming up, make sure your master’s application process goes as smoothly as possible. 1. Create a checklist for tasks you must finish and schedule time to complete it. Most of UW-Madison’s online master’s degrees have application processes consisting of five steps, with multiple requirements for each. Create a checklist in time order of the tasks you need to accomplish, with some specific hours scheduled to work on finishing it. When scheduling time, estimate the amount of time each task will take and double it so that you’ve got a cushion. If you try to complete it all at once, you’ll exhaust yourself. 2. Give your resume a facelift. While this is something you should strive to maintain on a regular basis, take some time to ensure your resume accurately portrays the contributions you are making in your current position. Many universities, including UW-Madison, have alumni offices with career services, including resume reviews. When writing your resume, focus on your accomplishments as opposed to your day-to-day tasks. Send a copy to a trusted friend or colleague for feedback. And always run multiple spelling and grammar checks—even the smallest errors can negatively affect your application. 3. Draft a copy of your “Reasons for Graduate Study” essay, with time for multiple revisions. While writing a personal statement might sound easy, it’s actually quite daunting for a lot of people–especially if they don’t write on a regular basis or have been out of school for some time. Before you work on a first draft, create an outline of everything you’d like to note, and then pick the strongest elements. Remember, the key to a successful personal statement is to create a strong argument for your intention to pursue an advanced degree. Avoid generic statements such as “I want to learn more about my field” or “I want to become a leader.” That’s a given. Tell the reader why you want to learn more. Are you looking to solve a specific problem in the field? If you’re seeking leadership, cite examples showing how the degree program will help you fulfill that role. Always tie your reasons for study directly back to the degree program. If you’re looking to fulfill a goal or learn a skill that is not relevant to the program, it might not be a good fit. (Note: Some universities will require you to answer a series of questions, or stick to a specific word count, so be sure to do your homework before starting. For instance, UW-Madison wants to know how your background is unique, what your leadership experience looks like, and why you feel the program is a good fit.) Bonus: UW-Madison’s student service coordinators are willing to look at your essay and provide feedback before you submit. 4. Touch base with those who are going to recommend you BEFORE you apply. Chances are, your immediate supervisor and colleagues may already know you’re planning to pursue an advanced degree. But a quick heads-up can prevent them from being caught off guard when they’re contacted. Also, consider giving them a copy of your resume and your statement of purpose (if applicable), so that they can get a clearer idea of what to say about your abilities or what you hope to study in their recommendations. As a courtesy, try to give them two weeks’ notice—at the very least, one week–before you submit your application. “The act now, apologize later” motto doesn’t work for graduate school applications. If you’re unsure about anything in the application process, contact the program’s student services coordinators for advice before you start. They’re always more than willing to provide guidance, and can prevent you from time-sucking missteps in the process. For more information about UW-Madison’s online master’s degree programs, more master’s application tips, or to contact a student services coordinator, click here or fill out the form below. Please describe the nature of your message. Does the idea of writing a graduate admissions essay freak you out? Don't worry! Here's how to make a compelling case for your admission. Click here for some tips.